Spiral Study is a 100 foot -16mm film made through the stop-animation of a book spinning in circles. The book depicted is titled Robert Smithson Spiral Jetty published by the Dia Art Foundation. 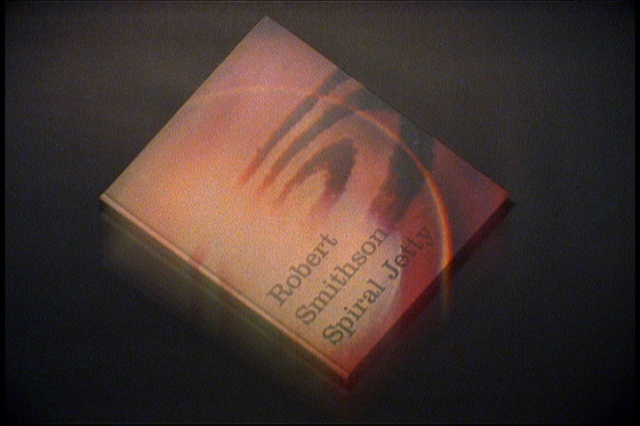 The image on the cover of the book is a still from the 1970 thirty two minute film Smithson made about his iconic earthwork the Spiral Jetty. Largely regarded as his signature statement the Jetty measures some fifteen hundred feet in length and is composed from 6,650 tons of basalt rocks. Here it is re-represented in a 100 foot spool of film.